Suppose you get one program to create a method which can do sum of two numbers, three numbers & four numbers by passing parameters. And what if, if program ask you to do sum of upto 20 numbers, so you will end up with writing 20 different methods, and most worst task is the user who will use your program he/she might needs to use remember all the methods name. So to overcome this scenario microsoft indroduces Method overloading. So in this case you will write 20 methods with the same name but having different method signature, so here user don’t need to remember all the methods name, he just need to remember single method name as sum. => It improves code readability & re-usability. For the mentioned example, instead of overloading and creating 20 methods (you mentioned) why can't you use a single method and a params array - which can hold array of homogeneous elements.? I agree, but what if user wants add mixed data type numbers (e.g int & float add, float & double etc) so in this case param array wont worked. Also we have option to use single method with optional parameters, but the concept of optional parameter came in .Net 4.0 onwards & its also have its advantage and disadvantage. 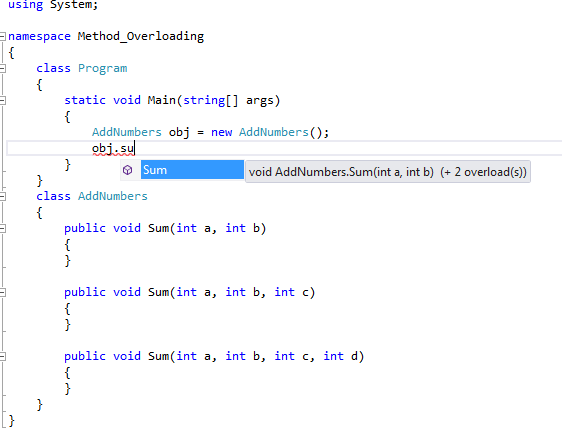 This is an example of where the exact same behavior needs to be executed against a number of varying parameter types. @clinton stevens: Thanks & alternative example is too good.